The New King James Version is a modernisation of the King James Version of 1611. It preserves the dignified style and the word and phrase order of the KJV but replaces words and expressions no longer easily understood. The slimline Cambridge Pitt Minion format is widely admired for its compact but clear type and its elegant binding styles. In the NKJV editions the words of Christ are printed in red and there are full cross-references, a dictionary/concordance and maps. This is a Bible binding of the very highest quality, printed on very thin and light India paper, with beautiful art-gilt edges. The pages are Smyth-sewn, giving the books plenty of support and allowing them to stay flat once open. The cover is made from brown goatskin leather, a supremely supple and flexible material, which not only looks and feels good, but will last for many years. This Bible has two ribbons to keep the place and a presentation page. 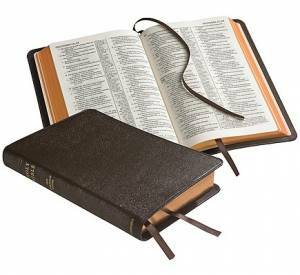 NKJV Pitt Minion Reference Bible: Brown, Goatskin Leather was published by Cambridge University Press in February 2010 and is our 17009th best seller. The ISBN for NKJV Pitt Minion Reference Bible: Brown, Goatskin Leather is 9780521132169. I am delighted with my purchase of this beautiful Bible. Unquestionable product description. Exquisite, well crafted with a beautiful goatskin dark brown flexible cover that gives a great feel of comfort when held within the hands - so appealing. It is soft and bendy yet compact. Pages are thin but strong with, I understand, a 6.75 font, which is small but I find comfortable to read. After ten months use, my Pitt Minion Bible is a joy to hold and read with the pages now separating easily as I turn to the required reading. In my opinion, this Bible will not disappoint and will provide years of enjoyable use for the reader who is comfortable with the size of print and is prepared to pay the price for such a beautiful NKJV Bible. Also makes an excellent gift at a wedding ceremony, first by giving a chosen Bible reading and then immediately handing the lovely Bible just read to the Bride and Groom. Got a question? No problem! Just click here to ask us about NKJV Pitt Minion Reference Bible: Brown, Goatskin Leather. Would you post this Bible to the Falkland Islands? If so, how much would the postage be? A:If you send an email to service@eden.co.uk someone will be able to shipping information for the Falkland Islands. However, thank you for using the Q&A Forum. What font size is used in the NKJV Pitt Minion Reference Edition NK466XR Brown Goatskin Leather and is the cover rigid? A:The font size in the NKJV bible you are enquiring about is 6.75. The cover of the bible provides good support, allowing the pages to lie flat when open. The material used to make the cover, which is goatskin leather, is supple and flexible.